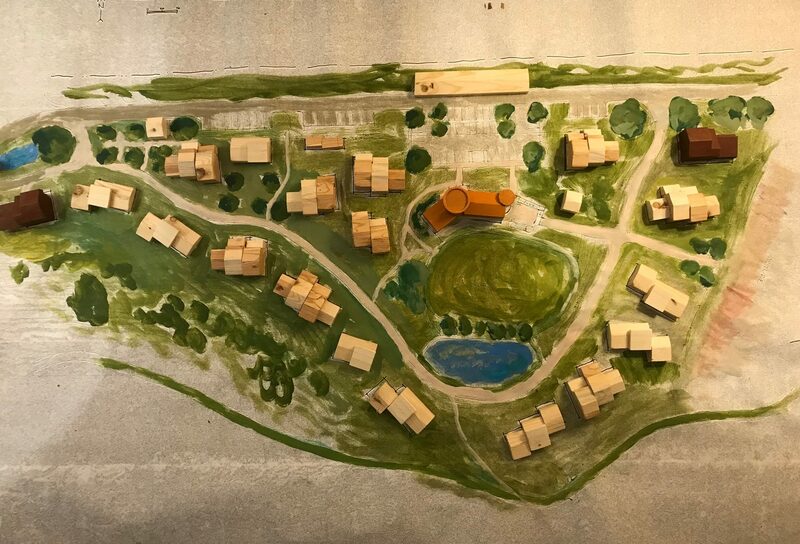 Our largest-scale design challenge is to fit the necessary structures onto the site we have chosen and that has been approved for for the village, while making a convivial and efficient matrix for our lives together and on the land. A large number of factors go into village site planning. First of all, we need to know how many of which types of structures we are going to build. This in turn depends on members’ need, on the projected needs of our preferred demographic, and on financial feasibilities of different possible mixes of members and their likely housing needs. This what we are calling the “Unit Mix” decision: PDD and GC are wrestling with it now. Beyond this, we need to develop a village site plan that works from multiple perspectives: architecturally (design and layout of individual buildings); on the scale of the village (massing of buildings as a whole, sight lines, clustering… livability and delightfulness in general), as well as drainage, fitting contour, allowance for utilities, traffic, etc. 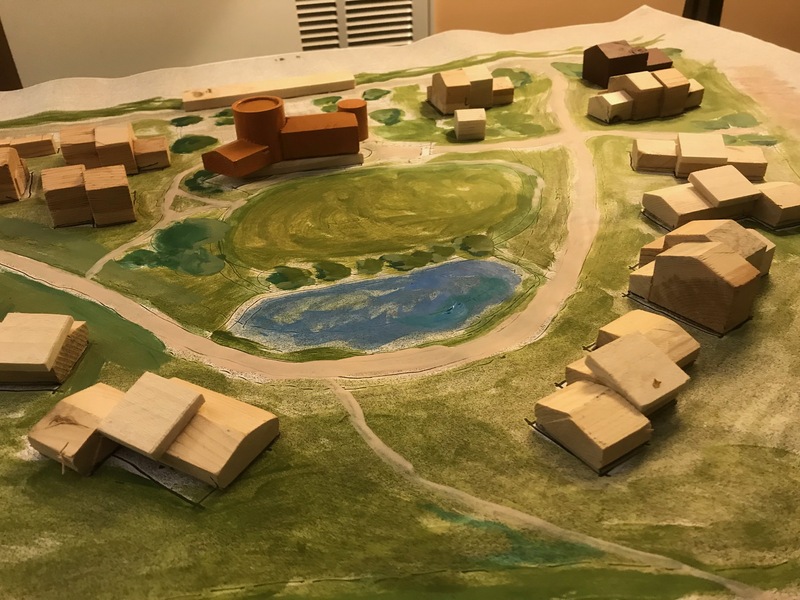 To begin the process of integrating these perspectives, we arranged a meeting in early February 2019 between Jonathan Lucas, our architect, and Greg Ramsey of Village Habitat Design, Atlanta, our village planner, and Bobby Tucker, of Bodhi Land and Design in Silk Hope, who is our land planner. Katy and Anthony organized and facilitated the event and took part from HM’s side. The meeting was exciting! (There’s an action shot above.) Three professionals, totally on our side, each bringing complementary expertise, working together around a map of the village site spread out on a pingpong table (the only surface big enough) in the basement of Jonathan’s house/office, using a set of blocks/models for the different kinds of structures and trying to work them into a workable — and then a wonderful — overall layout. Below are photos of the layout we finally arrived at. A little explanation: the different blocks represent the different types of structures currently planned (see the Residence page for details). The red-brown blocks at either end of the first, top-down photo are two Shared Houses. This was Greg’s idea to “book-end” the village and shade off into the surrounding open land. Of the natural-colored blocks, you’ll notice that some are lower than others. The lower ones are 1-story FlexHouses (most of them also have the attached suite offset to form an L-configuration; a few have no suite). The higher ones are 2-story FlexHouses. Many but not all of these have attached suites, and most are duplexed. The pumpkin-colored structure in the middle is one of several options Paul and Anthony produced to represent a possible Common House – which in fact is not yet designed. (See Common House page.) It’s just a placeholder for now. Along the north border the long low block represents a possible covered parking are (maybe with PV on top to charge the electric vehicles). See it yourself! The full-scale layout has been on display at Hart’s Nest, as well as going on the road for some presentations, and we’ll try to have it out for major HM meetings. More explanation. Please ask if you want to know more about any feature of this layout. There is a lot of quite careful thinking behind it. For example, Greg Ramsey is a master at attending to the feelings created by the flow of different size and configurations of building as you walk through the site, and there is much of his (very specific!) strategizing in this layout. It’s best if you try to catch Anthony or Katy while the model is present, and we would be most happy to give you a walk-through talk-through tour of the village. Ongoing process. This layout will definitely need tweaking and perhaps significant changes in the months ahead. It’s a first shot at an integrated plan, remember, and as such is a way to learn more about our needs and constraints. For example, as mentioned above, Unit Mix is a major factor, and one thing we learned form this exercise is that it may be difficult to fit our first envisioned unit mix onto the site as currently configured (for example, with quite so large a central green). So the mix may shift, and also the layout. We’re taking this as a strong start. Next steps. A fairly final site plan is necessary for site engineering (designing roads, drainage, house sites, etc.) – which we hope to begin in the summer, once we have soil test results and County go-ahead. Equally importantly, we hope it is already a compelling visual representation of the whole village for members and prospective members. If you squint a little, you can almost imagine yourself there. Won’t it be grand?